Chicago — The Duchossois Group (TDG) sponsored a custom-built space, designed by SmithGroupJJR, that is currenly occupied by its primary operating company Chamberlain Group (CGI). 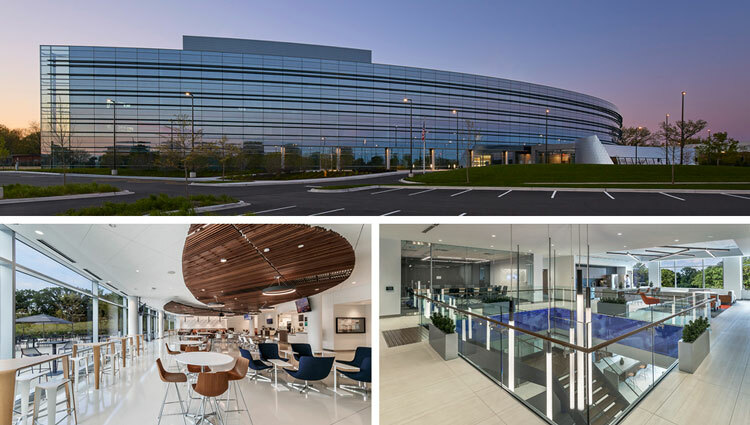 The move created a global headquarters that consolidated over 650-people from four Chicagoland facilities onto one 20-acre suburban campus, bringing the multi-disciplinary CGI team together for the first time into a dynamic new space. TDG selected Oak Brook, Illinois, to best support CGI’s strategic growth plans, resulting in a brand new 223,000-square-foot facility. The company’s goal was to create a modern and dynamic space that promotes a collaborative work environment, inspires its employees and potential recruits, and impresses clients. CGI — a leader in access control, residential garage door openers, commercial door operators, and perimeter access solutions, all connected through our MyQ technology — selected SmithGroupJJR to create a design for their new interdisciplinary headquarters that grows from the company’s vision to create a strategic, transformational platform that empowers, inspires and springboards the company’s legacy far into to the future. “Even though this is the Duchossois’ building, TDG was gracious enough to actively involve CGI employees in building the requirements for the new space. CGI’s goal was to have an environment designed to drive innovation and maximize collaboration, including a desire for openness and light, collaboration spaces, sustainability, wellness and a flexible work environment,” said CGI CEO JoAnna Sohovich. This highly flexible facility is designed around the idea of organizing interdisciplinary project teams into ‘fusion cells,’ which come together for intense periodic intervals during product development. SmithGroupJJR created interchangeable workplace modules that provide teams the agility needed to foster collaboration from concept through prototyping. This is further achieved in an advanced design lab; conference and training centers for customized employee and vendor education; and a product showroom and exhibit space. “The success of CGI’s new corporate headquarters is reflective of an interdisciplinary team approach which engaged the client in the strategic design process. The design solution translates CGI’s goals to create a highly adaptable environment that can accommodate dramatic growth with minimal intervention, while simultaneously maintaining the appropriate workplace density to enhance effective collaboration,” says Kay Wulf, IIDA, RID, principal and workplace studio leader at SmithGroupJJR’s Chicago office. “The design team created a building form that responds to its environment, and capitalizes on the sun’s movement across the horizon. The form is self-shaded, preventing unwanted solar gain in summer while harnessing the sun to heat the interior in winter,” said Architect and Design Leader Jason Smith. “As a result, the southern facade is clad with transparent, high performance glass with integrated, passive shades to optimize the balance of heat gain. The result is a minimized HVAC system size and substantial energy use intensity (EUI) improvement,” said Smith. As the exterior shape and façade were carefully crafted to balance heating and cooling, the floor plate depth allows for an interaction with the site’s mature woodlands and exterior views. The low-height workplace partitions provide incredible access to natural light with over 75% of the facility relying on daylight for over half the year. A mixture of internal amenities such as a full-service café and fitness center along with external features such as shaded outdoor seating areas and walking paths are designed to encourage meaningful collaboration, provide moments of respite, and enhance recruitment.